Surface Mount Technology (SMT) or Through-Hole: Is there a Clear Winner? While choosing electrical components for a new PCB can be a tedious task, it is undeniably important. Designers need to look through tens or even hundreds of variants of a part and check on current stock, future availability, and replacement parts. 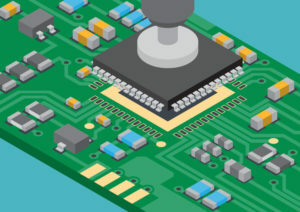 All of these options and considerations are very important, but before choosing components, we need to consider a much more fundamental question: surface-mount technology (SMT) or through-hole? Many people view through-hole devices as old-fashioned, with SMT being the modern style. While this may be true for many applications, through-hole technology still offers some significant advantages in certain circumstances. Through-hole components excel in boards that will be subject to high mechanical or thermal stress and have high power requirements. SMT, on the other hand, is better suited for small, lightweight PCBs that are going to be produced at a larger scale. If you open up a random consumer electronic device today, you probably won’t find many through-hole components inside. This doesn’t mean they don’t have a place in the PCB world anymore; it’s just that the majority of circuits today don’t require their unique advantages. Through-hole devices excel in physically demanding applications that also have high heat or power requirements and can be useful in prototyping. They are, however, less useful on small boards that need to be inexpensively mass produced. When it comes to stringent heat and shock requirements, through-hole’s secret lies in the soldering process. Through-hole components come with long leads that are inserted through holes in a PCB and then soldered to copper pads. This method of attachment is much more secure than the SMT style of mounting and allows through-hole boards to take on more physical and thermal stress. On average, through-hole components are also larger than SMT ones, which means they can usually handle higher power applications as well. Another advantage of through-hole soldering style is that components can be more easily removed and replaced during prototype iterations. If you need to dry another variant of some component, simply remove it and solder in a replacement. These advantages all come with costs, primarily in terms of board real-estate, manufacturing cost, and turnaround time. SMT components can be placed onto a PCB significantly faster than through-hole devices. Boards with through-hole components also need holes drilled through them, and both of these requirements lead to higher board costs. Through-hole components are also physically larger than SMT devices and can only be soldered to one side of the board. So if you need a tiny PCB that can be inexpensively manufactured, through-hole components may not be for you. SMT devices are very small, faster to place, and can be mounted on both sides of a PCB, making SMT boards much cheaper to manufacture. The assembly process doesn’t always go smoothly, as SMT components can suffer from a variety of issues during manufacturing. If you need a small, lightweight PCB that is cheap to make, SMT components are probably the right choice. They’re significantly smaller than through-hole devices and thus also weigh far less. Tiny components mean denser placement on a PCB, and with many electronics today focusing on size, this advantage can be hard to beat. The physical form of SMT components also lends itself to faster placement during assembly, resulting in less expensive runs over the lifetime of a product. Despite the apparent advantages, SMT manufacturing presents its own set of unique challenges. While components can be placed more quickly, the machinery required to do so is very expensive. Such high capital investment for the assembly process means that SMT components can push costs up for low volume prototype boards. Surface mounted components require more precision during manufacturing due to the increased complexity of routing blind/buried vias as opposed to through-hole. Precision is also important during design, as violations of your contract manufacturer’s (CM’s) DFM pad layout guidelines can lead to mounting issues such as tombstoning, which can significantly reduce the yield rate during a production run. When Should You Use Surface Mount Technology (SMT) Versus Through-Hole? While SMT is the newer, more compact component package style and through-hole is better-suited for larger boards, neither mounting style is going away anytime soon. Each option offers unique advantages and Table 1 can help you determine which best fits your design. If you’re designing a military grade PCB or delving into critical system design involving demanding physical and thermal requirements, you will probably want to go with through-hole components. If you’re making the next tiny consumer electronics device where every cent matters, then SMT devices are probably for you. No matter which style you decide to go with, Tempo Automation will be ready to bring your board to life. If you are ready to have your design manufactured, try our quote tool to upload your CAD and BOM files. If you want more information on choosing between surface mount technology (SMT) or through-hole, contact us.